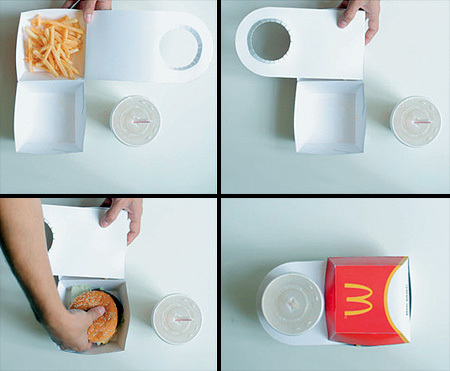 Innovative and creative packaging designed by Rob Bye allows people to easily carry McDonald’s Big Mac burger, fries, and a drink. 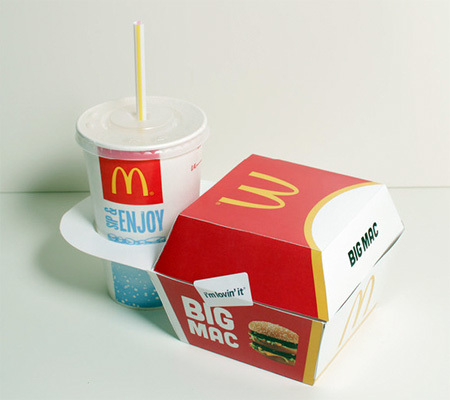 New, more efficient Big Mac meal packaging reduces waste and eliminates the need for separate fries container and a take away bag. 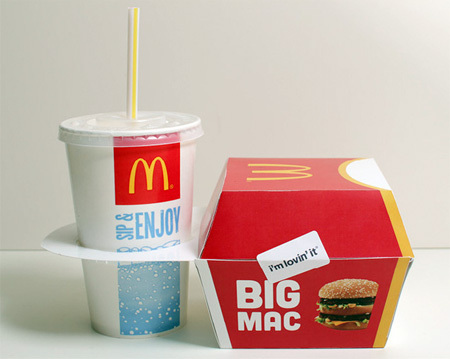 Big Mac and fries share the same box. The food is separated by the drink holder made out of cardboard. 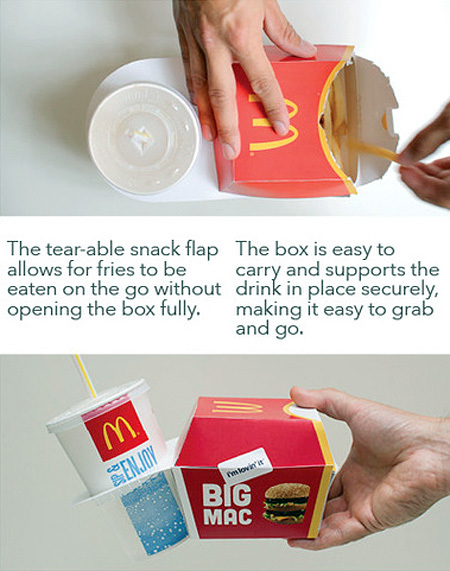 Top part of the box can be opened for easy access to delicious fries. Great idea. Correct me if I’m wrong, but if something is greasy (like a pizza box) isn’t it unrecyclable? 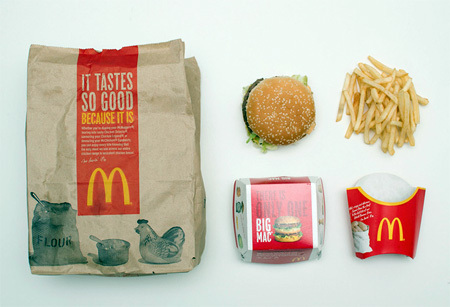 Yahhh more greasy food, haha joking, anyways I always put my chips on the opposite side of my burger packaging. Very nice concept. 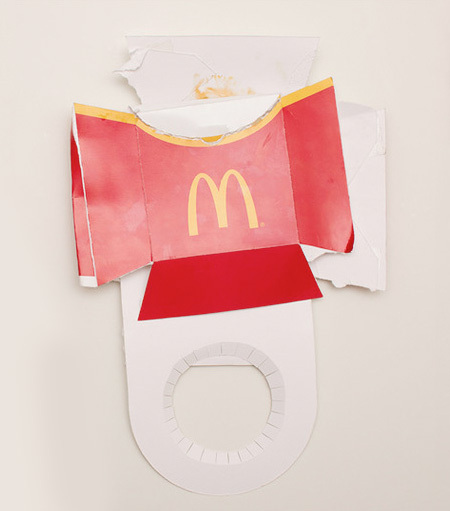 I think for MC Donlads it will be impractical as do not only sell menu’s. Next to that it will take more time to pack the order. WAY too sensible idea for them to use! I agree, If you only want a burger with no drink or fries the there is more waste. Yeah, great idea, but what if i order the “big” meal, with big fries.. how would they make difference between big fires and the regular ones? 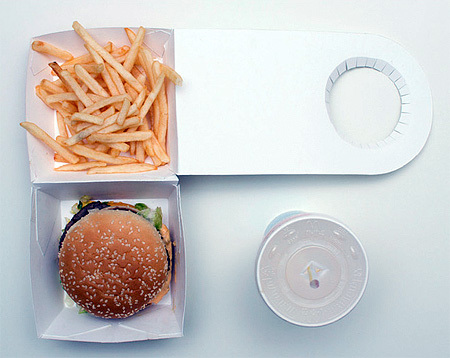 Interesting concept, i like the convenience of the fries in the top half with the tear away cover. However, I make the argument they go on the bottom burger on top upside down when folded. 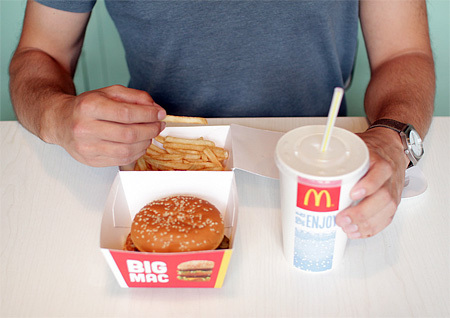 The reason for doing so is that the starch will retain the heat and therefore keep the burger warm longer.which is paramount as if you have ever had a cold McDonalds burger, its terrible, even more so than the fries when they are cold. i also make the argument for the box to have a concave outcrop on the side of the drink, instead of the traditional taper, as when you slide in the beverage it adds structure and adds sturdiness to the whole container. So it than allows the user to carry from the beverage as a handle for the unit allowing them to drink and carry. But what about Burger and fries with no drink, or Burger and drink with no fries? My point is you would need a new box for multiple combinations. This means more manufacturing, more training for employees, more time putting orders together…I applaud the idea, it’s novel but not practical. It’s ideas like this that get people thinking and maybe someone will develop something more practical. Very smart and the Ketchup? where is the Ketchup?